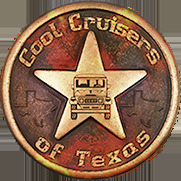 Below are Color Codes recorded by Cool Cruisers taken from the firewall identification plate of stock Land Cruisers we have restored. 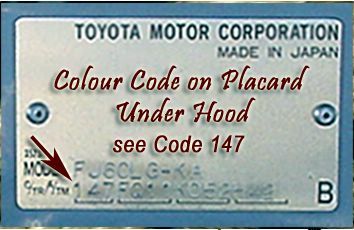 If you have a color that is not posted, please email CCOT with your Color Code, Series Model and Production Date of vehicle. 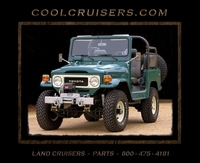 We will post your Land Cruiser color code information at this location. 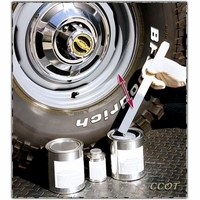 For a Factory Original FJ40 Finish, we paint all FJ40s with PPG Single Stage Acrylic Enamel. This is not the high gloss, shiny finish like modern cars feature, but rather a low luster shine that allows the forgiveness of minor field scratches to be buffed out. 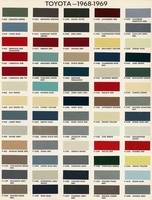 It takes about 2 gallons of paint to do inside and out of an FJ40. Also, be aware that the modern, shiny finish will greatly magnify any bodywork defects you may have. 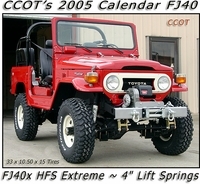 The original FJ40 Toyota acrylic enamel finish features a little orange peel to its final look. 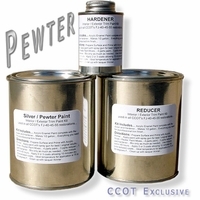 FJ60, FJ62 and FJ80 feature the shinier modern base coat clear coat finishes. 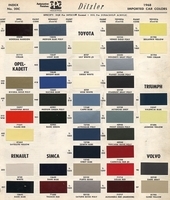 These Land Cruiser color codes are provided as a reference only. While viewing this web page, please be aware that monitor settings, color, contrast and brightness may change the true appearance of colors shown. 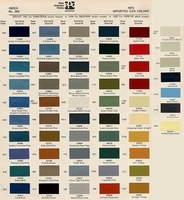 Hopefully all Color Codes provided are correct as it is our desire for this information to be useful to those restoring Land Cruisers to factory colors. 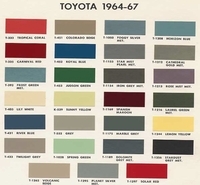 More Toyota Color Code information can be found at the Auto Color Library. 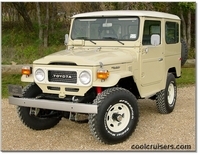 FJ40, White, Cygnus White, Hard Top, Front Grille. 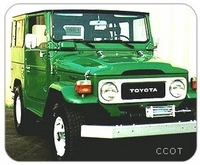 Note: The Rustic Green FJ40 (left) is fitted with CCOT's 4" HFS Lift Kit and 2.5" HFS Barbell Shackles. 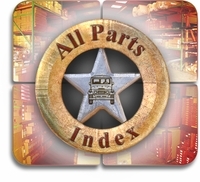 Tires are BF Goodrich Radial Mud Terrain T/As (33" x 10.5" x 15") mounted on factory wheels. CCOT restored this "One Owner" '73 model and found no printed color code on firewall or door jamb placard. Mike Scime believes the color is Pollux Orange, Color Code 304.
located on firewall under hood. Example, below.